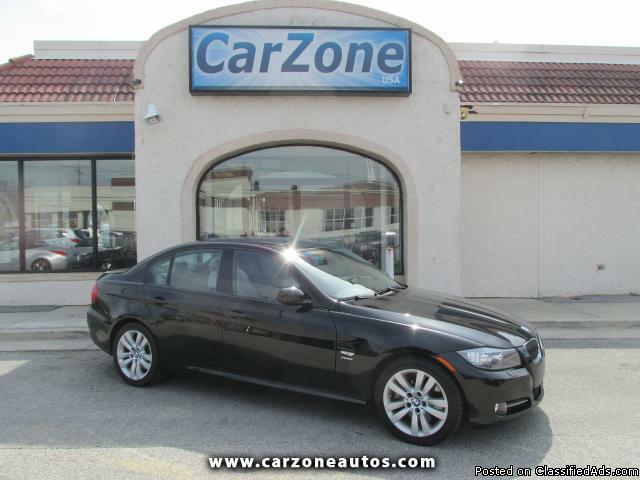 xxxx BMW 335i with X-Drive | ALL-WHEEL DRIVE | Jet Black with Tan Leather Interior | With a 9.8 out of 10 Critic's Rating from JD Power, the BMW 335i also received a 9.3 out of 10 performance rating and a 9 out of 10 safety rating! Critics from US News praised the 3-Series for its straightforward, high-quality cabin and Edmund's said it has ''near-perfect vehicle dynamics, a potent and refined engine, and a high-quality interior.'' JD Power gave it a 5 out of 5 power circle rating in overall performance and design, and consumers rave about its sporty styling, luxury interior, and great handling! The 335i with X-Drive is equipped with leather heated seats, woodgrain trim, push start ignition, navigation, bluetooth, 6-Disc CD player, HD Radio, satellite radio, auxiliary mp3 input, USB input, and separate driver and passenger automatic climate controls. If you're looking for sport and luxury with tons of horsepower, the 335i is the perfect solution for your driving needs!